McDonald's is suing Florence for €18m after it was blocked from opening a restaurant on one of the Italian city's most historic plazas. 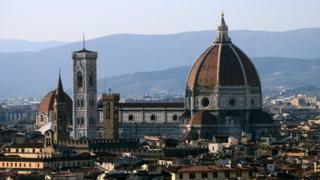 The fast-food giant had its plans for an outlet on the Piazza del Duomo rejected by Florence's mayor in June. The decision was upheld in July by a technical panel in charge of preserving the city's ancient heart. But McDonald's, which modified its proposals to fit with city guidelines, has now launched a bid for damages. The chain is claiming it has been discriminated against, and wants to recoup the €17.8m (£15.9m; $19.7m) it estimates it will lose over the next 18 years, according to Italian newspaper Firenze Today. It argues it put forward a plan to "operate respectfully towards the local policies, even accepting to introduce typical local products in our offer, as requested from the local commerce regulation". "We completely agree that the cultural and artistic heritage and the Italian historical town centres have to be protected and guaranteed, as well as the traditions and the historical small shops, but we cannot accept discriminatory regulations that damage the freedom of private initiative without being advantageous to anyone," McDonald's told the BBC in a statement. But Florence's mayor Dario Nardella says they were not prejudiced in rejecting the bid to open a branch on the piazza, famous for its Gothic and Renaissance architecture. He told the city council earlier this year: "McDonald's has the right to submit an application, because this is permitted under the law, but we also have the right to say no." This is the second high profile spat over an Italian location this year for McDonalds. Last month it was reported that cardinals at the Vatican had been angered by plans to open a branch in a piazza next to Saint Peter's Square.